Whether you were vogueing to her first record, the 1989 classic, "It's Over Now," claimed "Free" as "my song!" the summer of 1997 or just discovered her through her sleek new single, "Love's The Only Drug," singer Ultra Naté (her given name, by the way) once again beckons you to the dancefloor. With much anticipation and four albums under her belt, Ultra Naté delivers her fifth and strongest release to date with "Grime, Silk & Thunder." The album covers the spectrum from club-bangers and soulful house, to electro-boogie to pop gems and hybrid-disco. 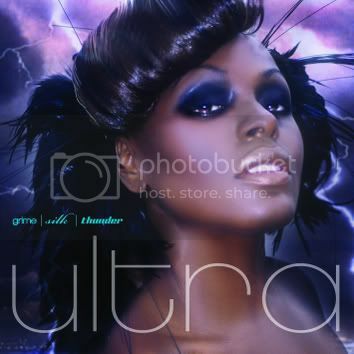 Ultra effortlessly revives the high energy and raw, soulful passion that's been all but forgotten on the dance floors. This is a much-welcomed return to form. A state-of-the-dancefloor aesthetic is fueled by explosive productions and crisp textures making "Grime, Silk and Thunder" grand and solid. The 14-song collection features support from such luminaries as StoneBridge (who mixed the entire album), Andres Levin (Yerba Buena), Eric Kupper, Quentin Harris, Dajae, N'Dea Davenport (Brand New Heavies), Mood II Swing, Chris Willis (vocalist for David Guetta), Morgan Page and GoodandEvil (Naty Botero).